I picked up two books at BookMarx in Springfield, Missouri when I was there for work last week. What books came into your house last week? 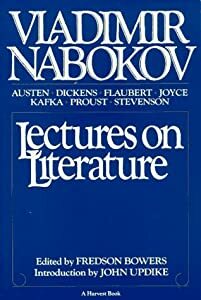 Vladimir Nabokov's Lectures on Literature, edited by Fredson Bowers, introduction by John Updike. This is a collection of Nabokov's lectures to undergraduates on Mansfield Park by Jane Austen, Bleak House by Charles Dickens, Madame Bovary by Gustave Flaubert, Dr. Jekyll & Mr. Hyde by Robert Luis Stevenson, Swann's Way by Marcel Proust, "The Metamorphosis" by Franz Kafka, and Ulysses by James Joyce. The Broken Estate: Essays on Literature and Belief by James Wood. I bought this on an impulse and suspect it will be a long time before I get to it.